Wow, Wow, and Wow again! This was my very first OnStage Live and I have to say, it exceeded my expectations. If you have ever thought about becoming a demonstrator, this alone is reason enough! 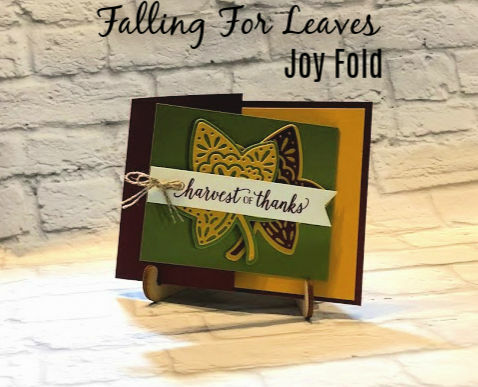 But for now, I have a fun project to share with you, using a fun fold, called the Joy Fold. I love cards that use this fold, it's kind of like having a card in a card. And I LOVE these colors together! I think this is my new Fall favorite combo! What's yours? The colors I used here are Merry Merlot, Old Olive and Crushed Curry and Very Vanilla. Stampin' Up! introduced a couple of Craft and Carry Bags, the Craft and Carry Stamparatus bag and the Craft and Carry Tote. The tote is a limited edition that is exclusive to demonstrators only. It will be available during Sale-a-bration for new demonstrators only that choose that as part of their starter kit. But, we current demonstrators are able to purchase this now and if you love it as much as I do, and want it now, just join my team today and you can add it to your starter kit NOW! Wowsers! Seriously, I would just join now and get it myself because I would be afraid that if I waited, they will be gone before I had a chance to sign up. But that's just me.